Bill Green’s new Poster design for Lebowski Fest West - L.A.
wonderful site---what a find. enjoyed the article about buddha especially. 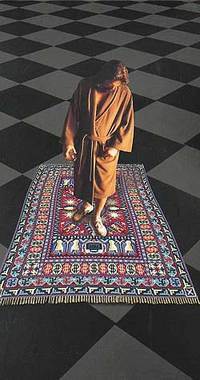 where did you get the wonderful pic of dude on rug on checkered floor. very symbollic, very eye-popping. i'd love to get a print of that for my husband (the dude of stone bank, wisconsin) for Christmas. any help?